The American West is a magical place. When we came west in 1993, I had grand, idealized visions like this in my mind. And of course, was a tad discouraged to be seeing flat field after flat field of grain and sagebrush on the way out. And then we hit Wyoming and the Big Horn Mountains! And those Tetons! Vistas like you see here, just exploding with beauty. I knew it existed. Just had to see it up close. This poster is dedicated to our love of the American West! 01. Printed on thick, durable, French Pop-Tone “Black Licorice” 100# cover stock! 02. Three colors! Inspired by the golden, lush West! Metallic Gold, Metallic Silver and Dark Gray. 04. Check out those metallics!!! So beautiful. 05. Proudly printed by our Portland buddies over at Seizure Palace! 08. 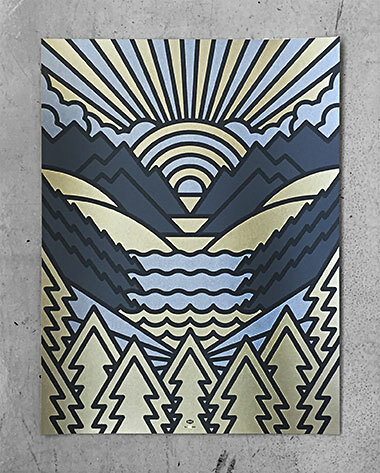 Free 3” x 24” burly kraft poster tube with each order! Reusable. 09. Two free white plastic end puck thingies.